Often listed as "Egg Drop Soup" in Chinese restaurants, this dish’s poetic name of Egg Flower Soup celebrates the way eggs “blossom” as they are stirred gently into simmering broth. If you use canned or frozen chicken stock, this soup makes a perfect busy-night dish. If you make chicken broth, this dish showcases its flavor with delicious simplicity. 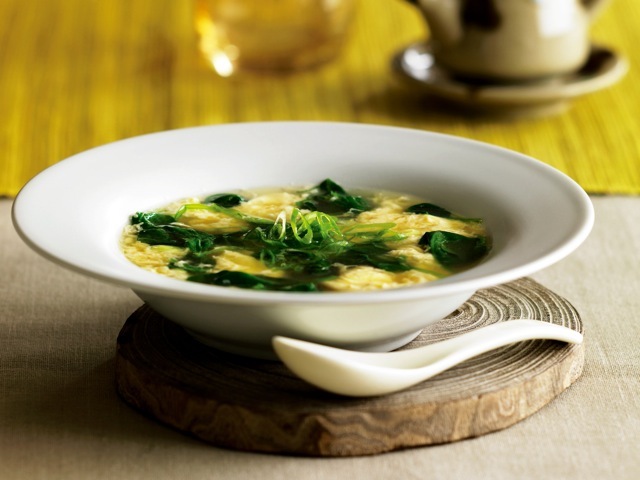 Either way, Egg Flower Soup rounds out any rice-centered meal, and it can be served in big bowls over rice as a one-dish dinner. Plan to stir in the eggs just before serving for the most wonderful texture and beauty. In a medium saucepan, bring the chicken stock to a rolling boil over medium-high heat. Stir in the spinach leaves, sesame oil, and salt, allowing the spinach to wilt into the soup. Stir well until the chicken broth is swirling in circles. Carefully and slowly pour the beaten eggs onto the surface of the soup, continuing to stir gently and encouraging them to flow out into leafy petals and ribbons. Sprinkle the green onion onto the soup and serve hot.